[Highlights]ESGS 2015 Indie Games, Competitive Gaming, & More! MANILA, PHILIPPINES (Oct 21, 2015) – ESGS – One of the most anticipated and biggest gaming convention in the Philippines, is proud present the highlights of the Two Day event – Featuring Indie Games, E-Sports Competitions, Cosplay Competitions, Competitive Games, and many more! Happening this coming October 24-25, 2015 at the SMX Convention Center Function Room 1 to 4, ESGS 2015 is the second run of the series and it is organized by Gariath Concepts and is co-presented by PLDT Home and GameX. Brawfest is a newly introduced competitive gaming tournament from Playbook, PinoyPS, HotSeat, Imperium, & Rumpus Room Booth. The event wide tournament comprises of 14 famous console fighting games and everyone is welcome to participate in any of the titles. Registration starts by 10:00 AM on a first-come first-serve basis. Sony PlayStation is proud to announce the much awaited Call of Duty: Black Ops III Competition at ESGS 2015.Experience the game and its multiplayer mode before everyone else, and get a chance to win prizes from Sony Playstation. In cooperation with Anime Alliance Philippines, ESGS brings you the best in gaming-cosplay. Join the competition, and who knows, you might become one of the winners who could bring home a cash prize and a special gaming wall scroll straight from the Tokyo Game Show 2015. 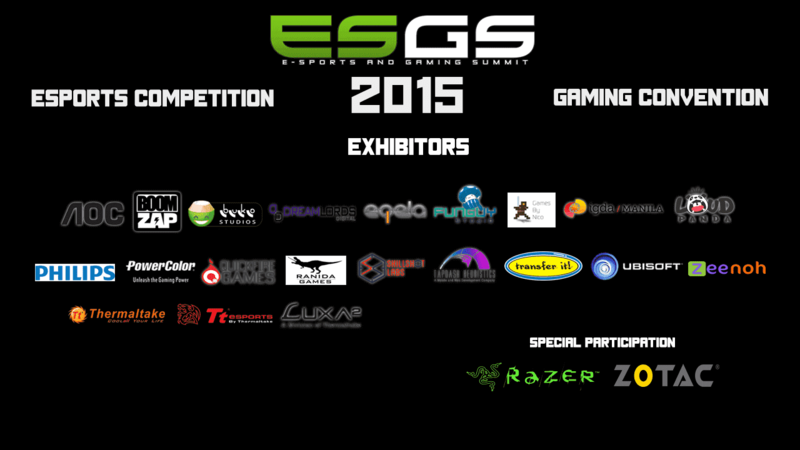 ESGS 2015 won’t be complete without the exhibitors. Together with ESGS, each exhibitors features their own activities, and even raffles so participation is a must! ESGS 2015’s Tickets are now available at SM Cinemas nationwide and will continue to be sold at the event proper. Each ticket are priced at 185 Pesos. Hurry, while you still can! Gariath Concepts, in partnership with other organizers, is the organizing body for ESGS. They are behind successful gaming events such as Pinoy Gaming Festival: Summer Event, Pinoy Gaming Festival (Main) and the recently launched brand (co-organized with Mineski Events Team), E-Sports Tour (EST) among others.